I’m starting to see research studies pop up that support the use of electronic media (usually iPads) with young children. One that caught my eye recently was the Advantage 2014 program in Auburn, Maine. This program began in September 2011 and gave each child an iPad for instructional use in the classroom. 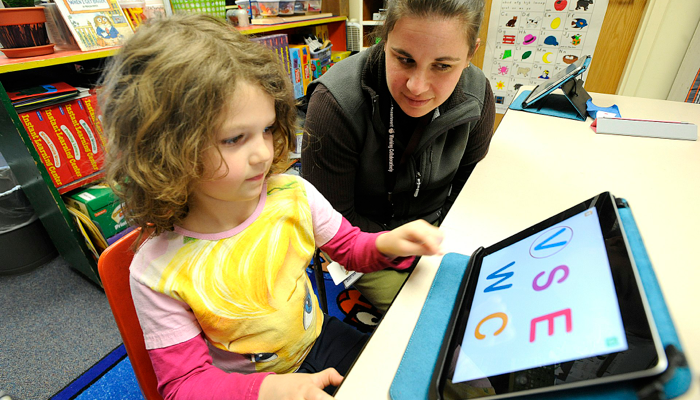 Half of the kindergarden classrooms received their iPads in September, and half received traditional teaching methods until they received their iPads in December. When you look at the research summary, the results are not startling, but they are consistent. There are naysayers who attribute the increased performance in the experimental group to the shinyness of a new toy, and they speculate that these kind of results will normalize over time. Maybe so. I can’t wait to see what other research comes out in the next few years. One thing that really rang my bell was that the largest gain in this study was in phonemic awareness. So cool! They also include a Rubric for evaluating apps for children which is going to be very useful for me as I stomp off into the brave new world of App/eBook collection development. Posted on February 26, 2012, in Apps, Early Literacy, Education, iPad, Literacy, Media Literacy, Research and tagged Research. Bookmark the permalink. Leave a comment.